We offer a wide variety of automatic spiral mixers depends on your needs. Our mixing bowl’s thickened flat ring is supported by thrust roller. Because of this design, it makes the whole mixing bowl more stable during the operation. The central breaker bar and spiral arm are made of SUS 431. In terms of the design of dough bar, it adopts blade type rather than cylinder type so that it can produce the maximum torque, combined with mixing hook. 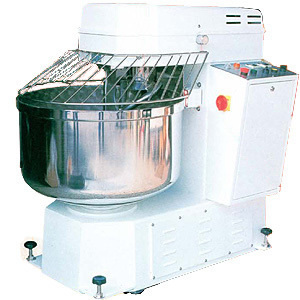 General spiral mixer:It is suitable for normal bread, yam paste, glue pudding, or product with soft dough. Re-enforced spiral mixer:It is suitable for the product with hard dough such as high gluten bread, steamed stuffed bun, steamed bun, or dumpling skin. It needs thickened mixing hook and augmented horsepower. Spiral mixer with fixed bowl: For automatic spiral mixer with fixed bowl, the dough capacity ranges from 25 kg to 160 kg. Spiral mixer with removable bowl: As for automatic spiral mixer with removable bowl, the dough capacity ranges from 130 kg to 400 kg. Thickened flat ring supported by thrust roller, making the whole mixing bowl more stable during the operation. Central breaker bar, spiral arm, and safety grid made by sus304.